Whether you are looking to apply custom printed candle labels to glass jars or plastic pods, you’ll need to be able to produce labels to a certain size to ensure a professional, seamless fit. The human eye notices when a label is a generic size and has been applied to a custom pack format and doesn’t quite fit. There is a large number of different sizes of jars used in candle manufacture; not just in terms of shape but also size/diameter/volume. Whether you are looking to apply single, smaller labels or even a wrap around label you’ll need to be able to determine the exact size. When it comes to applying candle labels to pods, you’ll more than likely require a circular label produced to a non standard diameter or a square label with rounded corners. Rest-assured, as a professional label manufacturer, we offer all custom shapes and sizes for candle labels; it really comes down to the imagination of the brand owner and label designer. 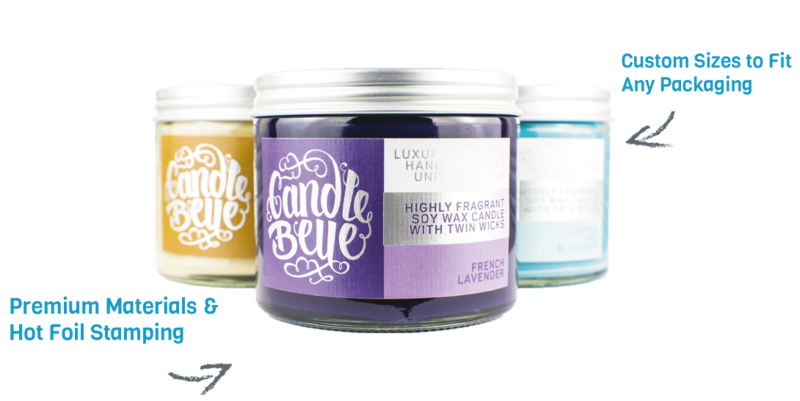 Where brand owners have a number of candle scents within their range, utilising digital label printing makes complete sense. Where the size of the labels remain the same across all scents, we can produce all your labels in one print run. This allows you to keep the label printing process for your candle labels cost-effective. Digital label printing also allows you to produce seasonal variants alongside your core range; you are able to split the total number of labels produced across an unlimited number of scents. This is also useful should you find you have a clear best seller; simply share a larger proportion of the overall order to this variant. All the materials that we offer are industry ready and feature a permanent adhesive; once the label has been applied they are designed to remain on the product. Temperature shouldn’t affect either the material or the adhesive; we recommend requesting a Sample Book to both review the quality of our print, materials and premium finishes but also to test the materials in their intended environment. Label artwork always has been and always will be a key part of the label printing process and producing candle labels is no different. For businesses who do not have resources to ensure their artwork is print-ready, we have a range of Artwork Services available. There are many reasons as to why your candle manufacture business may need to see a press-proof before placing a full custom label order. We’ve developed a range of cost-effective proofing services.